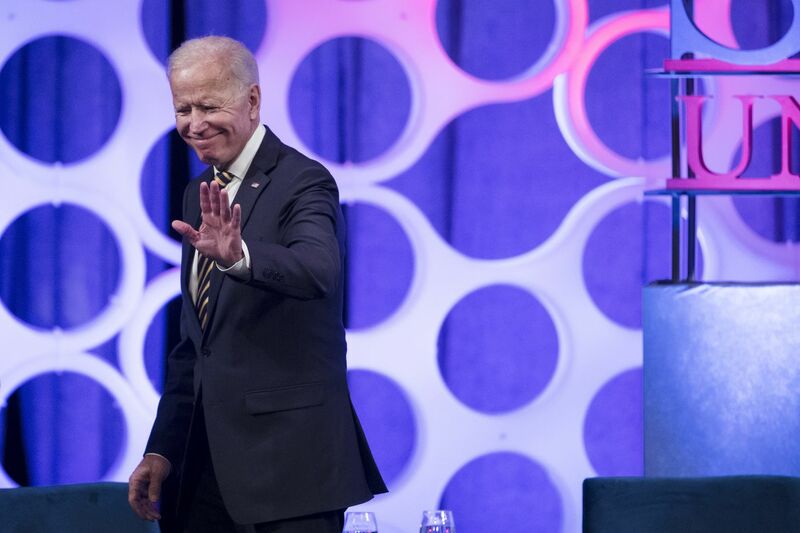 Former Vice President Joe Biden departs from a forum on the opioid epidemic at the University of Pennsylvania in Philadelphia, Thursday, April 11, 2019. At a forum on the opioid crisis Thursday, Mayor Jim Kenney voiced full-throated support for a supervised injection site in Philadelphia to help address the worst urban overdose crisis in the country, while acknowleding it will be tough to overcome opposition to the plan. “Legitimately, neighbors are scared. They’re in the epicenter, and their kids are in the center of the problem," Kenney said at the University of Pennsylvania. “We’ve done four major cleanups this year in Kensington and Fairhill, and the number of discarded needles is amazing." His fellow panelists at the event — former Vice President Joe Biden and former Florida Gov. Jeb Bush — didn’t engage on the topic. Instead, the two men, both Penn professors, talked about keeping doctors from overprescribing opioid pain pills, widely blamed for sparking the nation’s deadliest drug crisis years ago. That’s not the big issue in Philadelphia, where, as painkiller prescriptions have decreased, deaths from illicit opioids have soared, and the powerful synthetic opioid fentanyl has contaminated much of the street drug supply. Advocates say that a facility where people can use drugs under medical supervision, be revived if they overdose, and be connected with treatment is a key to slowing a death toll that tops more than 1,000 people a year in Philadelphia. Kenney made repeated references to a supervised injection site and dire conditions in Kensington, but neither Bush nor Biden commented on that or other forms of harm reduction. At Thursday’s forum, moderated by Penn president Amy Gutmann, Kenney also addressed resistance to the supervised injection sites from Kensington residents who feel it would be yet another stain on their blighted community and an admission that the city has given up on them. “It’s very, very difficult to explain to neighbors, this is a good thing, that we’re saving lives," Kenney said. A supervised injection site, he added, is a place “to interact with social workers and addiction services. You can’t do that when a person is living" in a homeless encampment. Kenney has grown more vocal about supervised injection sites since the city announced in January 2018 that it would permit one to open with private funding. Kenney skipped that news conference in favor of a WWE Royal Rumble announcement, though he did say he supported the site. On Thursday, Bush and Biden focused on how they dealt with the burgeoning opioid crisis as public officials, with Bush citing his expansion of drug courts throughout Florida, and Biden defending his often-criticized 1990s crime bill by noting that it empowered drug courts as well. Biden, a Democrat who did not mention his possible presidential run, did acknowledge “a big mistake” in that bill: “Us buying into the idea that crack cocaine was different from powder cocaine.” Imposing harsher penalties for dealing crack is widely considered to have meant decades of mass incarceration that decimated communities of color. Kensington residents frequently note this disparity with the handling of the opioid crisis, which has affected far more white Americans, though overdoses among people of color are on the rise. When fentanyl, the drug behind the vast majority of Philadelphia’s opioid deaths, was discussed Thursday, it was mostly in the context of how to stop it from getting into the country. “The physician prescribing issue is solvable, and it’s getting solved,” said panelist Bertha Madras, a Harvard University Medical School psychobiologist and a member of a recent presidential commission on the opioid crisis. “I don’t think that’s where the future of policy lies. The future of policy lies in the new fentanyl analogues," she said, referring to the illicit supply so deadly in Philadelphia. Because much of the country’s fentanyl supply comes from China via Mexico and enters through legal ports of entry, Biden said, X-ray devices that could detect unusually heavy payloads in shipping containers would be cheaper than, say, President Donald Trump’s wall. “I’m not being a wiseguy about the wall and the president,” he clarified. Republican Bush, whose daughter has struggled with opioid addiction, and Biden both spoke of how stigma keeps people from seeking treatment. They said Americans need to think about pain differently, and not expect that it can be eliminated through medicine. Madras noted that most of the country’s drug treatment programs do not offer all three forms of medication-assisted treatment, the gold standard for treating opioid addiction because in studies they have been shown to offer the best chance of long-lasting recovery. And the lack of access to the best treatment, said Jeanmarie Perrone, a professor of emergency medicine at Penn, is one of the best arguments for supervised injection sites. “We have treatment capacity for medication-assisted treatment that is not being used,” Perrone said. “We are working hard to get patients into treatment. We have three patients dying a day here. We are at a huge crisis.